“First week was all about emerging in the Balinese culture. We also had the opportunity to watch a Traditional Balinese dance show and making a Batik painting, fried banana and tempeh, and make a Canang Sari which is a flower offering as a form of thanking for the peace given to the world; it is the simplest daily household offering in Bali. All the coordinators of Green Lion were most helpful and friendly those two weeks I was there. 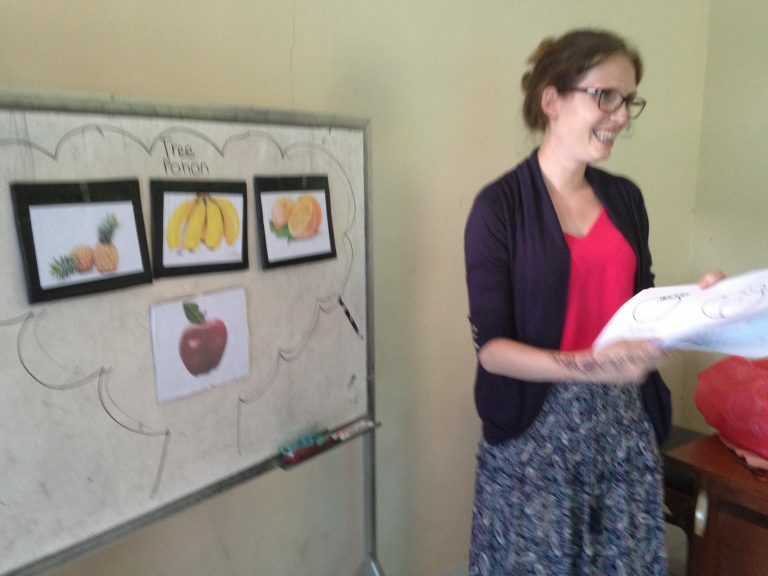 The second week was all about teaching Balinese children English. Topic of the week in our school was trees, flowers and plants. On the first day there was a special ceremony that was held at the school. All the children sat on the ground and prayed together while the teacher sprinkled the children with holy water. Afterwards every child had to apply the holy water on their forehead, chin and neck the same with rice. The children had only tables and chairs in their classroom. No play areas, they were cramped together in one room. Did you know that a normal preschool day in Bali only lasts 2,5 hours? I was responsible for a classroom of 28 children accompanied with a Bahasa-speaking-coordinator. In order to teach I learned many words in Bahasa. 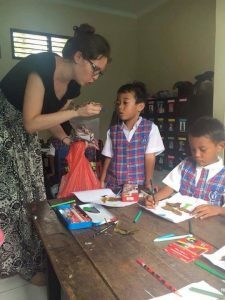 The children need to know the words in Bahasa first so they could make a connection in English more easier.